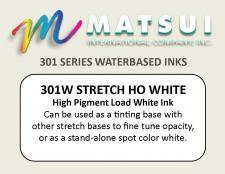 301W HO Stretch White is a stand-alone spot color white and is also used in mixing formulas to increase opacity or create pastel colormatches. 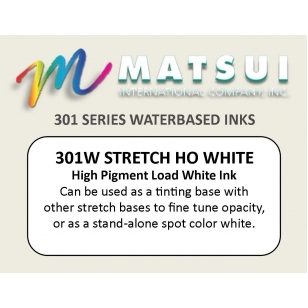 Matsui 301W HO Stretch White 5.0 301W Stretch HO White 11/08/2016 By Dogbone Prodctions Great ink for booty shorts or anything that needs more stretch to it.. 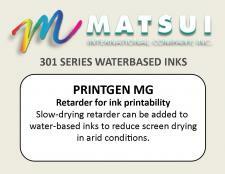 Excellent coverage and it's smooth and creamy. We add Fixer-N for more wash-ability and a lower cure temp.